DFM grad Aaron Dunn, MD, (left photo, center) and third-year resident Konstantin Mikheyev, DO, (right) received WAFP awards this year. 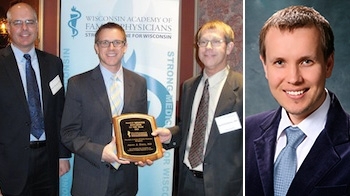 A current and a former UW Department of Family Medicine (DFM) resident both received awards from the Wisconsin Academy of Family Physicians (WAFP) at its annual meeting in January 2014. Konstantin Mikheyev, DO, a third-year osteopathic resident in the Fox Valley residency program, was named the 2013 recipient of the WAFP Foundation’s Glenn P. Clifford memorial scholarship. The Clifford Scholarship provides a minimum of $1000 to support the housing and travel expenses of a Wisconsin family medicine resident seeking supplemental training. It’s named for Glenn Clifford, DO, a 1997 graduate of the Fox Valley residency program, who practiced urgent care in the Fox Valley area for four years before dying of cancer at age 38. Dr. Mikheyev will use the scholarship to train at the Center for Addictive Disorders at the University of Wisconsin–Madison. Aaron Dunn, MD, a 2005 graduate of the DFM’s Madison residency program, was named the 2013 recipient of the WAFP’s Family Medicine Educator of the Year award. The award recognizes physicians who provide outstanding and comprehensive family medicine education to medical students, residents and new physicians, and who demonstrate a balance between career and personal life. Dr. Dunn is affiliated with Dean Clinic in Mineral Point and Dodgeville, Wisconsin, and the Upland Hills Health Hospital, a critical access rural hospital also in Dodgeville. He is also the founder and medical director of Community Connections Free Clinic, which serves Iowa County’s uninsured. In addition, he is the team physician at Mineral Point High School, and is a local community clinical preceptor supervising and training MD/NP students and residents in family medicine. “Dr. Dunn has been instrumental in increasing the medical student and resident education and support by our physicians in our practice and at the hospital,” said Cathryn Kaiser, MD, assistant medical director of quality improvement at St. Mary’s/Dean Ventures, Inc.